Photos for this article come courtesy of the good old Wayback Machine. 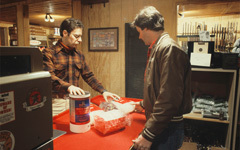 Head on back with us to the 1980s and John Paul's original gun store, Lloyd's Sport Shop. We get this call a lot; thank goodness, it's usually not one of our rifles causing problems. For anyone in the gun business, it's the same. Guys need some assistance with whatever issue is giving them trouble. So, we ask what the problem is, only to hear something like, "It jams every so often." Doesn't get any more vague than that, now does it? Most conversations that start like this don't get clearer as they go. We want to help you help us (or any other gunsmith you work with). Your "gun doctor" is there to help, and communication is the key to making that happen. The more information, the better. Extraneous info doesn't hurt the effort, but missing info does. So, there you are with you malfunctioning rifle. You need some good advice from your gunsmith. Here's what to do to get the useful information you'll need he'll need. When something goes wrong with your gun, get into detective mode immediately. The odds of you noticing and remembering something important from this moment fall off rapidly. Obviously, this isn't always easy. If you have a malfunction in a fire fight or at a match, you're probably too preoccupied. If that's the case, see about repeating the incident under less stressful circumstances. If you are just shooting recreationally and lives and scores are not at risk, then stop and look when a malfunction occurs. Take a moment to figure out what really happened. Did the last case extract from the chamber? Did it clear the ejection port? Is it stove-piped with the bolt pinching it to the front of the port? What about the next round? Is it partially in the chamber? Is it still half in the magazine with the bolt on top of it? Pay attention to every detail. If you can't remember, take some notes about the exact situation as near as you can tell. If you can, snap a photo of the stoppage with your smartphone. Usually, the problem lies in the gun itself, but sometimes external forces are at work. Take note of the temperature, humidity, dust, moisture, etc. of your shooting environment, especially if they're conspicuous. What else has the rifle been through leading up to this moment? Has it been anywhere or in any condition that could be at play? Gas-operated rifles in particular are very complex devices. They rely on several factors being within acceptable ranges to function. Something small can be all it takes to knock the rifle out of commission. Part of assessing the circumstances of your firearm's failure might be admitting to your own. We know—we're gunsmiths, not priests. But sometimes, you need to confess. What's the state of your gun? Have it been cleaned recently? Is it just coming out of storage? Did you do work on it recently? Fess up to any mods you've done, especially if they're recent. As gunsmiths, we've seen all the questionable stuff you can imagine and probably done it ourselves. If you fail to mention something critical (even if it is embarrassing), it's harder to help. This list is pretty specific to AR-style rifles, but it gives you a good idea of the detail you should have ready. A lot can get lost in communication, especially over the phone when you gunsmith doesn't have the gun in front of him. You should know what you're looking at and call it by its proper name. Sometimes, this is as simple as distinguishing between "failure to fire" and "failure to feed." You know what they mean when you read them, but make sure the right term comes out of your mouth. "You knew what I meant," doesn't always cut it. Many times, a customer will say the rifle fails to eject when what he really meant is that the rifle failed to extract. That's a big difference when seeking a diagnosis. If the fired case is still in the chamber, and the bolt is attempting to feed a round behind it, this is not a double-feed but a failure to extract. If the fired case is fully out of the chamber but stuck in the upper receiver in combination with the next round trying to feed, then you have a failure to eject. If the fired case has ejected and is somewhere on the ground, the rifle did indeed fire, extract and eject. Is the bolt on top of the next round in the magazine and putting a big dent in it? Did the bolt pick up the rim of the next case and attempt to strip it from the magazine? Is the round still partially in the magazine, stopped with the tip on the feed ramp? Is the round half in the chamber? Is the next live round actually in the chamber with another round stacked behind it? The point here is to understand the full sequence of events in the firing of the rifle. Then, try to see and understand at just what point this sequence is interrupted. When you go to your gunsmith for help, remember that both sides want get the problem resolved. 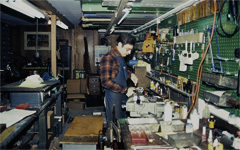 Your gunsmith brings his knowledge and expertise. You need to bring him the information he needs. When you carefully and fully assess the circumstances of your malfunction and communicate that, you're doing your part. Heck, with a thorough assessment, you might just figure out the problem yourself. But even if you don't, you are much more likely to get a useful diagnosis and an effective solution.